This section tells you how to access the Edit mode of a portlet and edit it. Define your desired portlet to check if this portlet has been existing in the portal or page. If not, drag and drop it from Edit Inline Composer to the main portal body while editing the portal's layout, or editing a page. Hover your cursor over your desired portlet, then click at the upper left corner of that portlet. The Edit form will be displayed. Normally, a portlet has four tabs: Portlet Setting, Select Icon, Decoration Themes and Access Permission. However, some portlets may also have Edit Mode and Preferences tabs. For example, IFrame and Dashboard portlets have the Edit Mode tab where administrators can define the interface details. Make changes on fields in the various tabs. The Portlet Setting tab allows you to change values related to settings of your selected portlet. Display Name The display name of portlet which cannot be changed. Portlet Title The portlet title with the length between 3 and 60 characters. Width The portlet's vertical size. The value of this field must be in numeric format. Height The portlet's horizontal size. The value of this field must be in numeric format. Show Info Bar The option enables the information bar to be shown or hidden. If the Show Info Bar checkbox is not selected, Portlet Mode and Window State will not be displayed in that portlet. Show Portlet Mode The option enables the portlet mode to be shown or hidden. Show Window State The option enables the portlet's window state to be shown or not. Description The brief information of the portlet. The length must be between 0 and 255 characters. The Select Icon tab allows you to select an icon for the portlet. By clicking Get Default, you do not have to select any icon from the list, the suitable icon will be got automatically. The Decoration Themes tab allows you to select a theme for the portlet from the themes list. By clicking Get Default, you do not have to choose any theme, it will be automatically set. The Access Permission tab allows you to set the access permission on the portlet. The portlet can be made public to everyone or restricted to specific groups. 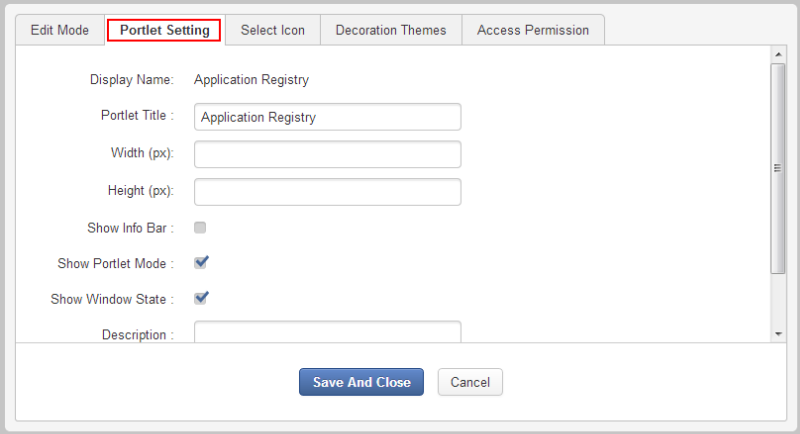 See the Setting Access permission on a portlet section for details on how to assign the access permission on a portlet. Click Save And Close to accept your changes, then click to quit the Edit Inline Composer/ Page Editor page.